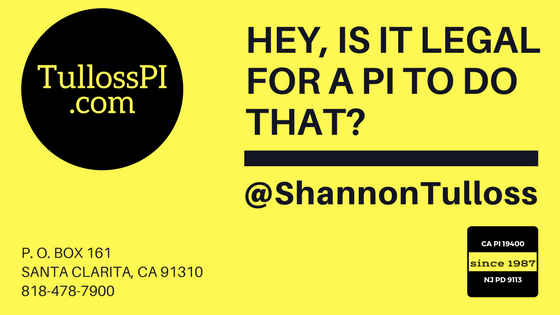 Shannon Tulloss Investigations | Is it Legal for PI’s to…..
Hey, is it legal for a P.I. to do that? Long answer: Never hire a PI that says that they will do this for your or if they “know a guy” who can do it for you. THIS IS ILLEGAL AND ANY PI WHO DOES THIS FOR YOU SHOULD BE PROSECUTED. This is called “wiretapping”. In California, the law is very clear. It is even very difficult for law enforcement to tap a line legally- even in a criminal investigation. Aiding or conspiring with anyone else to do any of the things on this list. Also, you should know that any evidence that is gathered using illegal means will cause you to lose your footing, if not your entire case in court. And, you deserve better than that. Do yourself a solid and steer clear of PI’s who cross this line! Wondering if another method is okay with the courts? Give us a ring, and we will be happy to talk it over with you. After 30 years of performing investigations, we absolutely will have some other options for you that you will find interesting. We are known for thinking outside of the box, not crossing the line. Call us at 818-478-7900 and tell us your story!